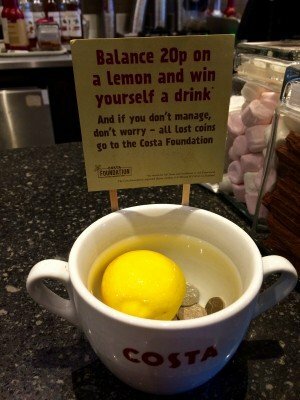 While waiting for my coffee to be made at Costas I noticed a lemon floating in a cup of water on the counter with a tantalizing teaser besides it: “balance 20p on the lemon and win yourself a drink”. I have never tried to do that before and so was curious to see if I could. 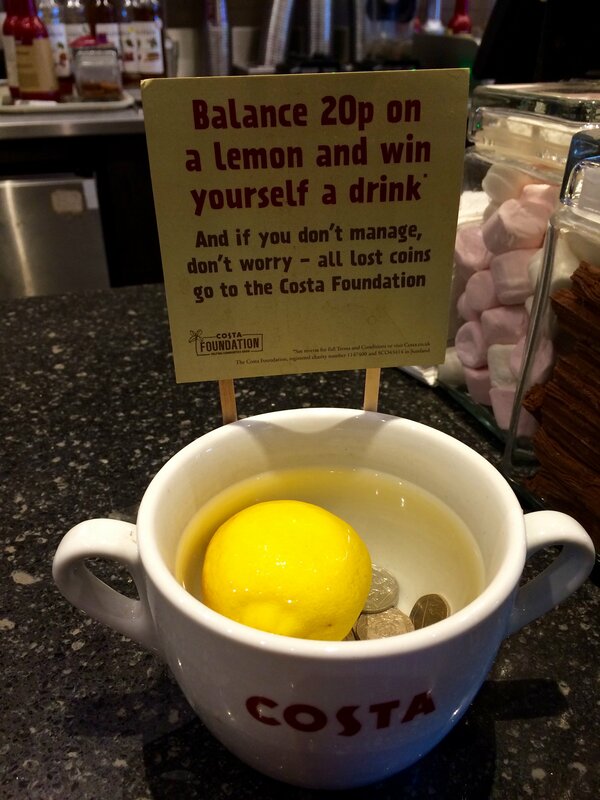 Of course, my delicately placed coin slipped off the lemon and slunk into the cup of water as the lemon rolled over like a barrel with the weight of the coin. It lodged itself in the bottom of the cup along with several other 20 pence pieces. I asked the barista if anyone had achieved the seemingly simple feat and she said, wisely, yes a couple of customers had but she had no idea how. Perhaps, the secret is to hold the lemon with one hand to stabilize it while using the other hand to place the coin on top of the lemon. Somehow I felt that might be cheating and not in the spirit of raising money for a good cause – in this case it was the Costa Foundation. It seems that other pubs and cafes have also been using this trick as the video below shows someone trying to do the same at Weatherspoons. I failed to find a video of anyone succeeding the lemon test. Raising money for charity has seen many innovations over the years. Last year the ice bucket challenge was all the rage where people poured a bucket of iced water over their’s or someone else’s head to promote awareness of the disease amyotrophic lateral sclerosis. In doing so, it was intended to encourage people to donate to research. An integral part of the challenge was to upload a video to Twitter or other social media platform. The silliness went viral; over 2 million tagged videos appeared on Facebook, alone. 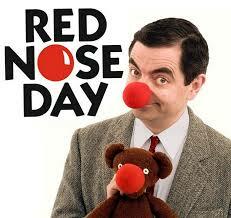 An annual favourite event in the UK is Red Nose day, organized by Comic Relief. Lots of people don a plastic or furry red ball on their nose and do something equally silly. Last year, they raised nearly 100 million pounds. Rather than freeze to death, people did all sorts of other crazy things, such as getting everyone to come into work with their face painted in some funny way. Passers-by are encouraged to dig into their pockets or go to the website and donate whatever they can. It always seems like lots of fun for those participating. The money that Comic Relief raise is then spent on all sorts of projects to transform the lives of millions of people, both in the UK and across Africa. The name often given to this kind of feel-good and good-humored charity raising lark is somewhat unfairly, called “slacktivism” – implying that doing something silly with minimum effort to show that you support a good cause is rather shallow – because it does not require any long-term involvement or commitment. Most people don’t agree. Even if it is only one-off, it manages to raise millions of pounds while increasing people’s awareness about certain diseases or good causes. According to the Huffington Post, scientists were able to make a scientific breakthrough from the money donated from the ice bucket challenge last year, namely identifying a protein that fails in the cells of most ALS patients that importantly, can be repaired. That seems like a mighty achievement. But a dark side to how charities run themselves is starting to raise its ugly head. While many spend wisely the money collected by people having lots of fun there has been a growing concern about some charities who are splashing the cash as if they were heading up a company or corporation. Fat cat salaries for execs is one example that is raising crossed eyebrows. More worrying, is how some charities are selling services and products to unwitting customers which are not the best deal for them – so that they can raise ever more cash. One that has come to light recently is the sale of car insurance by a charity that many people trust because it is meant to be looking after their interests. Because the charity is recommending a package many assume it is the best one for them. Given that there are now a myriad of packages for insurance, Internet Service providers, and utilities, it would seem a worthy thing to be doing. But the truth is that some charities may be suggesting options that are not the best value for money or in the interest of the customer concerned – but which helps them to line their coffers. Now, that is really taking the biscuit. Far worse than a bit of harmless slacktivism. I’ll happily have another go at the lemon test but pass on the counter of irresistible cakes that also lure you to spend more.